Sales tax has a huge problem in America: it is only charged if the consumer and retailer are in the same state. This rule was probably created before transactions occurred across states – before the phone and Internet were invented. The problem is that you, a wise shopper, can avoid paying sales tax by ordering from online stores that do not have establishments in your state. A narrow-minded person would say, “There’s nothing wrong with this – you’re just saving money.” The main problem is that it encourages business to be unnaturally inefficient. 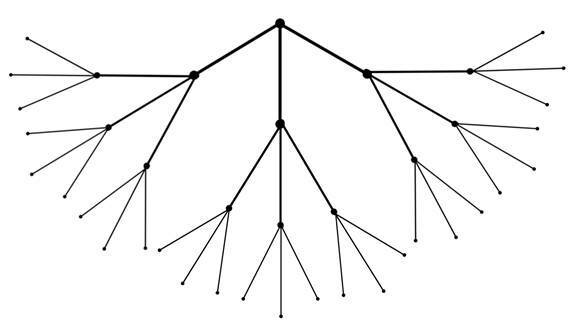 A hierarchy (tree), as shown above, is inherently efficient. For bacterial growth, tree growth, city expansion, product distribution, etc. following the hierarchy is optimal. In a hierarchy, the most-shared things are at the “top” and the least-shared things are at the “bottom”. Because of the sales tax rule, smart shoppers often buy things from retail stores outside of their own state. As a result, packages are shipped extra -long distances. This hurts the government because it does not receive tax dollars it should have received. It may compensate by raising taxes elsewhere. This harms the environment because of all the fuel that is burned up during shipping. This hurts the entire country because it creates more work than the amount that is actually needed. For example, a man wants to buy a $200 computer he saw at his local store. Say sales tax is 10% in his state, so the total is $220. He wisely orders it online, where the price is $200 with $10 shipping and no sales tax. He saves $10. The government does not receive $20 in tax. The local store loses a sale. If the local store makes an online store, it can also sell to out-of-state buyers and stay in business. The shipping company makes money from the buyer and/or seller. This occurs all throughout America. The shipping company would not exist in a country that does not have sales tax because their services would not be in demand. People would buy from the local store. This is natural and efficient. As a result, this country’s environment is cleaner and its government and citizens are richer. The solution is to change the sales tax rule. One possibility is to make sales tax based on the location of the seller only. There are no loopholes to this; if the state does not have sales tax, then surely operating a business in that state is costly in another way. Another solution is to not have sales tax at all. The government would have to raise tax elsewhere to compensate. Again, the seller makes money from its advantage over its tax-collecting competitors. The buyer saves money from not buying within his or her state. The government does not receive money. The shipping company that moved the product from California to Nevada and then back to California makes money from the buyer and/or seller. The shipping company’s role only exists because of the sales tax rule. It should not exist. “But it creates more jobs,” says the narrow-minded fool.